Cesky Krumlov was built on a meandering bend in the River Vltava around the originally gothic castle from the 13th century. Despite the passage of time, the town together with chateau complex has retained its exemplary mediaeval character for more than five centuries. 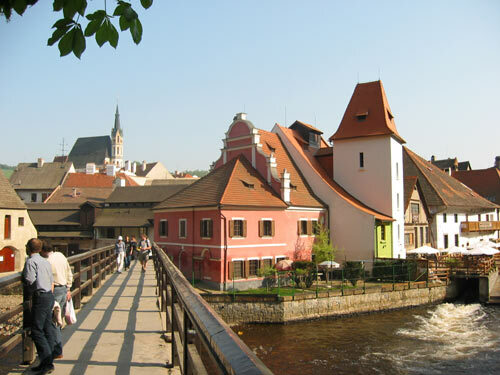 The town Cesky Krumlov is dominated by two grate landmarks: the chateau complex and the gothic Church of St.Vitus. Cesky Krumlov chateau complex is one of the largest in Central Europe. Complex is composed of more than forty historical buildings, a cylindrical tower reconstructed in its preset form in the 16th century, unique Baroque theatre with original equipment and fittings. Under the Castle Complex lies the old town with its winding alleys and venerable Gothic and Renaissance houses, many galleries, little shops and inns. The historical core is protected by UNESCO.